Rules-based optimisation is great but only if you anticipate every possible eventuality and link the conditions in the correct order to react to them. Bionic is different, we are pioneers in dynamic algorithmic optimisation. Simply define your KPI’s and we will take it from there, constantly and dynamically managing bids and budgets to deliver your optimal ROI/ROAS. You are in control and can completely customise how Bionic will manage your campaigns with minimum human intervention. Every business is different, find out what works and what doesn’t. Split your audience to see what is impacting campaign performance. Run lift tests to determine the true impact of Facebook Advertising. Mix and match elements of Bionic Optimisation to get the optimal return. 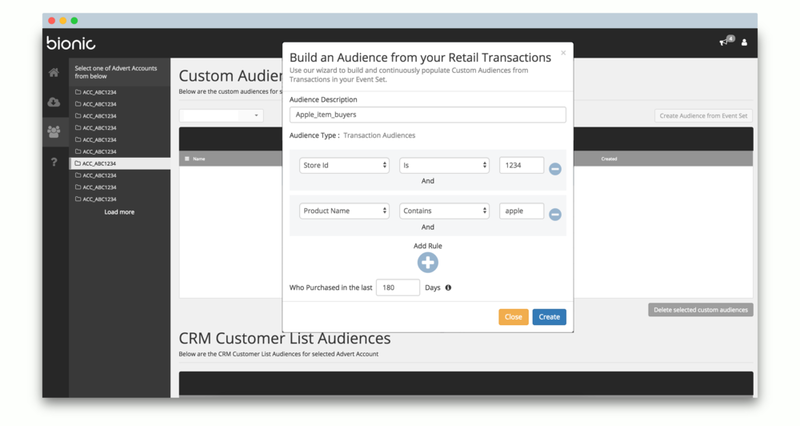 Retailers use “Bionic Transaction Audiences” to automatically build and continuously populate Facebook audiences based on in-store transaction with our user friendly simple wizard. Create a targeting group to upsell accessories that are compatible with products bought in-store, improve lookalikes and remove customers from prospecting pools. Cross sell products based on top-selling items, seasonality, store inventory, or even profitability. Sometimes decisions can’t be automated and often there is no substitute for experience and judgement. Bionic will collate and organise a personalised stream of recommendations that will enable you to rapidly intervene to make timely and effective manual campaign changes. Businesses that use Bionic to bridge online to offline (o2o) include automotive dealerships and call centres. Bionic Lead Automation integrates with existing destinations for Facebook Lead Ad campaigns easily and quickly. Build industry specific dynamic product ads for omnichannel Retail, Travel, Real Estate and Automotive industries. Do you work with a specialist product feed provider that sources and curates UGC video and static imagery? Let our account management team know and we’ll integrate directly to Bionic. Understand your results with strong visuals populated with the metrics that matter to you and your business. Choose from dozens of KPIs from both online & in-store actions. Bionic is built for customisation, if you have a metric that is unique to you and your business, we are happy to help incorporate it into Bionic. Do you have a reporting or dashboard solution that you have invested time and effort in getting “just right”? Don’t waste that investment and don’t waste time working on two systems. Get in touch with your Bionic account manager and we will work with you to integrate. Today’s consumers seamlessly move between online and offline worlds. Bionic’s ground-breaking omnichannel technology won Facebook’s coveted Spotlight Innovation Award for omnichannel Advertising. With Bionic you can securely upload, sync and optimise web, app, in-store, call centre, store visit and other offline data. Leverage this 360 degree data to build and optimise omnichannel campaigns personalised to each user. Accurately attribute in-store sales to Facebook campaigns. Get granular breakouts of in-store metrics or set up combined performance metrics to show overall omnichannel performance.